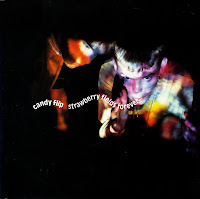 Candy Flip were a British electronic dance band associated with the Madchester music scene in the early Nineties. They were named after the slang term for the practice of taking ecstasy and LSD at the same time. The band consisted of Danny Spencer, Kelvin Andrews and Ric Peet. The band reached number 3 in the UK singles chart with their electronic cover version of the Beatles' 'Strawberry fields forever' in 1990. The track sampled the drum beat from the track 'Funky Drummer' by James Brown. Candy Flip split up in 1992.